Please send a letter now to Chancellor Carranza to rescind the decision to close PS 25 and allow the school to grow by putting a PreKch and a 3K class in the school for next year. As described earlier on this blog, and in several news articles, Judge Katherine Levine of the Kings County Supreme Court blocked the DOE from closing PS 25 Eubie Blake, and on May 24 extended the temporary restraining order to allow this Bed Stuy public school to remain open for at least another year. 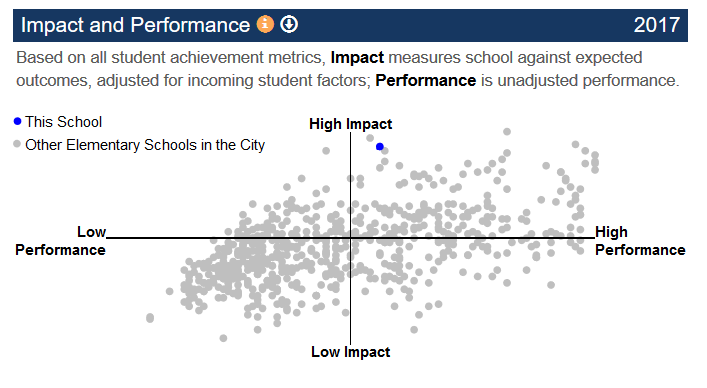 The DOE had proposed closing the school, ostensibly because it was “under-enrolled.” And yet by the their own admission, it was the fourth best elementary school in the entire city, according to the “impact” rating on the DOE performance dashboard, which former Chancellor Carmen Farina had boasted was the “most advanced tool of its kind.” While the school is above average on performance on raw test scores and attendance, its impact is stellar if one takes into account the socioeconomic background and need level of the students. When asked what the downside would be if the school remain open for another year, Kruk replied that 3,000 students from all the schools DOE had proposed closing could not be re-assigned to different schools, which Judge Levine said was “ridiculous.” Only those students who currently attended PS 25 and whose parents wanted to remain there would be affected. Ms. Kruk: “Okay, understood, and your Honor, I would stress even if the equities don’t weigh in the Department of Education’s favor—"
The Judge then asked if the DOE would agree to promise that if the school closed, its students would be able to attend a better school than PS 25. Because the city could not explain what damage would be done by keeping the school open for another year, and the DOE could not promise that they would attend a better school (indeed there are only three in the entire city, and none have been offered) the Judge ordered that the school stay open at least another year. Over that time, she would carefully untangle the complicated legal issues involved, including whether a vote of the Community Education Council was required to close this zoned school. In the end, what was evident from the city’s arguments that apart from the illegality of closing a zoned school without the approval of the CEC, the DOE has no justification for closing PS 25, at least none that they were willing to make public at this time. Soon, however, Eva Moskowitz went on the warpath. On June 11, she sent out a press advisory, announcing she would hold a rally in front of City Hall the next day, to protest that the DOE was denying space to “Success Academy Lafayette Middle School” in the building, a school, which by the way, did not yet exist. I had known that a Success elementary school, Success Bed Stuy 3, had moved into the PS 25 building in the fall of 2016. PS 25 was originally a K-8 school, but several DOE’s decisions had contributed to its enrollment shrinking over time. As of 2004-2005 school year, PS 25 had 773 students throughout grades K-8. In the fall of 2006, the upper grades of PS 25 were separated from the elementary school, creating the Upper School at PS 25 (IS 534), leaving PS 25 to serve only grades K-5. Then in 2016, the same year that Success Bed Stuy 3 moved into the building. IS 534 was moved half a mile away and merged with PS 308 Clara Cardwell, a far less successful school with an impact rating of .30. Most likely these two decisions were linked. Chancellor’s regulation A-190 in accordance with NY education law Section 2590-h requires that any change in the utilization of a public school building must follow a certain legal process, including the posting of an EIS at least six months ahead of the next school year, followed by public hearings and a vote of the Panel for Educational Policy. However, whether adding a middle school into the building or converting Success Bed Stuy 3 into middle school and moving its current students elsewhere would entail a change in school utilization, and would legally require the process described above. An EIS would have had to be posted no later than March 5, given the six-month waiting period outlined in state law and Chancellor’s regs. This never occurred, and it would be too late to happen now, at the end of the school year. “In the event that the chancellor determines that …. significant change in school utilization is immediately necessary for the preservation of student health, safety or general welfare, the chancellor may temporarily…. adopt a significant change in the school’s utilization on an emergency basis. —Education Law §2590-h(2-a) (f)”. Yet this section in the law is supposed to be contemplated only in the cases of actual unexpected emergencies, like hurricanes or other disasters rendering school buildings uninhabitable, so that entire classes of students would have to attend school in other buildings. It would surely be illegal to cite this exception to allow a charter school to move into the PS 25 building at the last minute, with no such rationale. The day before, Deputy Chancellor Elizabeth Rose had responded to Eva Moskowitz’s press advisory, with a letter released to the press, that laid out alternatives for space that could be provided to her middle school class of 70 students. These alternatives included a list of facilities that Success already occupies in Brooklyn, or would occupy starting next fall, all within .7 to 3.7 miles of PS 25 and totaling more than three thousand available seats, arrayed in four DOE-owned buildings and two stand-alone buildings. Because three of these buildings would only house Success students, including one in a DOE-owned building, Rose added the following notation in the right-most column of the chart: “No EIS for this building”– suggesting that no waiting period, no public process or vote would have to occur to change the building’s utilization, itself a rather questionable interpretation of the law. 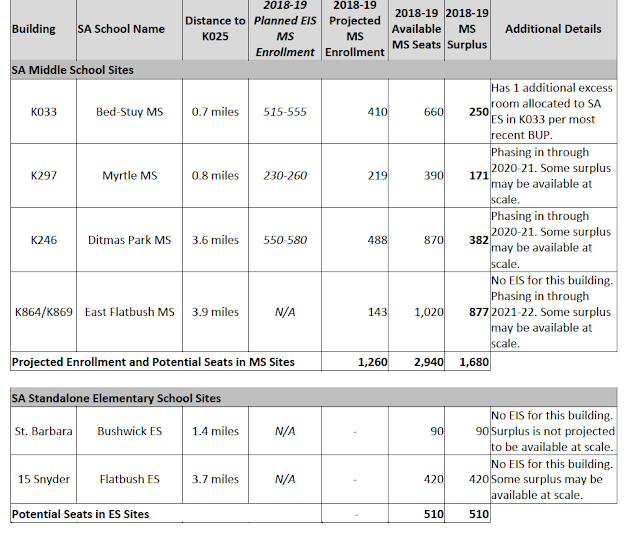 There is no exception in Section 2590-h that would allow changes in school utilization to evade the required public process in the case of a DOE-owned building, even if it only contains a charter school. The Panel for Educational Policy unanimously voted to approve the closure of P.S. 25 at a public meeting on February 28, 2018. Success Academy requested additional rooms in K025 for the 2018-­‐2019 school year to serve fifth grade students from Success Academy Cobble Hill. The DOE agreed to this request, for one year only, under the assumption that Success Academy Bed-­‐Stuy 3 would be the only other school operating in K025 during the 2018-­‐2019 school year…. First, Rose’s statement that the vote to close PS 25 was unanimous is false. As the PEP minutes of the February 28 meeting confirm, the vote was 8-5 as is usual with controversial proposals, with every mayoral appointee voting yes, and every borough appointee voting no. Second, the idea that this would be only a “temporary” arrangement, and that Moskowitz would agree to move the middle school out of the PS 25 building after one year is risible; especially as she is already claiming eviction when her school was never in the building in the first place. Yet whether or not PS 25 had closed, moving a new Success middle school into the building would have violated both Chancellor’s regulations and Education Law 2590h without an EIS and a separate vote of the PEP. Instead, the DOE could have proposed doing this if they had posted an EIS by March 5. They could have done this even earlier in December, when the proposal to close PS 25 was first announced. Why they didn’t and instead insisted they had no additional plans for the building until now is hard to understand– unless Rose thought by doing so would provoke even more community opposition and suspicion that the real reason the DOE wanted to close the school was to enable Eva Moskowitz to further expand her charter empire. This would not have been the first time the DOE cleared out an entire public-school building for Eva. Check out the “East Flatbush” building with 1000 empty seats listed in the chart above, K864/K869 in District 22. In December, one month before the proposal to close PS 25 was announced, the DOE proposed to move P.S. 361, an early childhood school, out of its building, and move it into P.S. 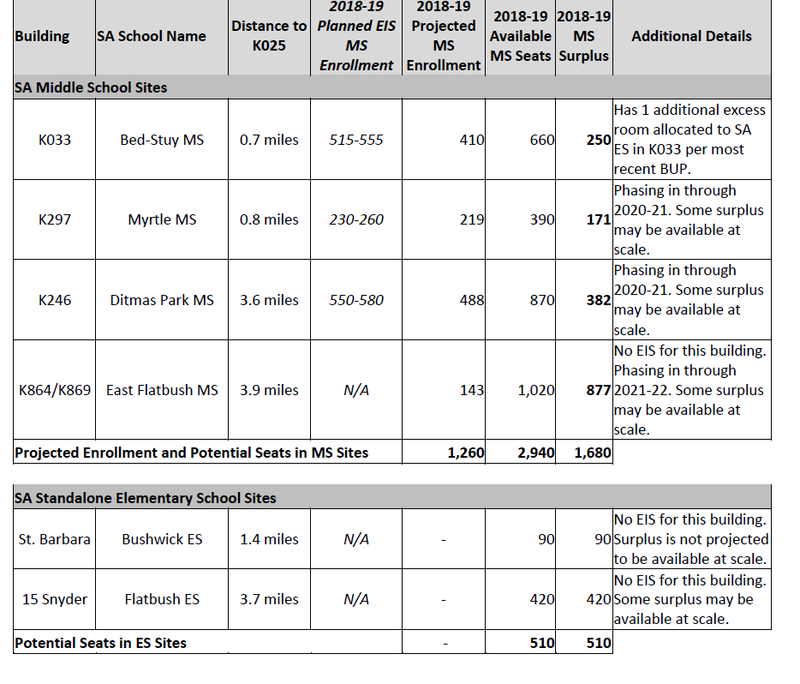 269, despite the fact that the EIS projected that this move would overcrowd PS 269 building up to 102%. The school would also likely lose its science room, its space for ESL services, and more. All this, despite the fact that PS 269 is already a struggling “priority” school according to the state, and as a Community school, receives “wraparound” services from DOE. The entire building K864/K869 was emptied for the purpose of giving it to Success for its new East Flatbush middle school next fall. Note that word evicted, once again; though there was never a Success Academy Lafayette Middle School, it was never sited in Building K025. Once PS 25’s closure was halted by the court, the only school that was supposed to be evicted would be Success Bed Stuy 3, which Eva herself planned to move out to make way for her middle school. At 12 percent, the percentage of Cobble Hill’s disabled students is only about half of the citywide average. It has a lower economic need index than average and far fewer English language learners. Its impact rating is high at .89 – but not as high as PS 25’s at .93. 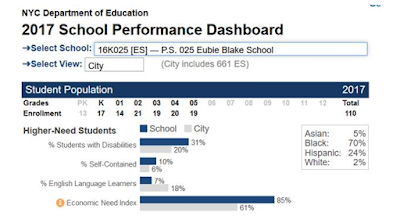 Moreover, the demographic snapshot for Success Cobble Hill elementary school suggests a significant rate of attrition at the school. In 2013, there were 105 1st graders, with that number falling to only 68 fifth graders this year. 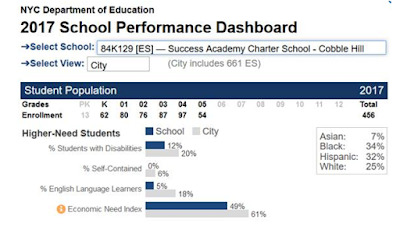 Compare the student composition of PS 25: last year 85 percent of students were economically disadvantaged, and this year 99 percent are in poverty, according to the DOE’s demographic snapshot. In every respect they are needier than the city average. And while its total enrollment is small, PS 25 does not appear to be losing significant numbers of students over time, unlike SA Cobble Hill. There is little information on the dashboard for students at Success Bed Stuy 3, whom Eva was prepared to move out the building, or “evict”, to make way for her more “diverse” middle school. The DOE demographic snapshot shows that the poverty level of Bed Stuy 3 has dramatically increased from 52.4% to 74.3% this year. Perhaps that’s why Eva is so eager to displace its students, to provide room for the more advantaged (though yes, more diverse) Success Academy Cobble Hill students. In any case, Eva continues to regularly send out press releases and is currently engaged in a petition campaign, urging the Mayor and the chancellor to give into her demands. Reporters continue to run stories about her claims, though none of them have pointed out the absurdity of her repeated use of the term “evicted”, even as she is content to entertain the prospect that other students, including the students of PS 25 and those currently attending Success Bed Stuy 3, should be moved elsewhere to make space for her middle school. And no reporters have yet challenged the questionable legality of her earlier secret agreement with DOE. When PS 25 parents learned of the judge’s decision, they were thrilled, and its teachers were ecstatic. A little boy who attends the school later told me that while he had cried when he heard that the school was closing, he was so happy when he heard it would stay open for another year. Please send a letter to Chancellor Carranza to rescind the DOE’s decision to close PS 25 and allow the school to grow by putting a PreK and a 3K class in the school for next year.